Yesterday, on a beautiful autumn morning in Pasadena, Fuller Theological Seminary installed its fifth president since its founding in 1947 (the previous two presidents served terms of 30 and 20 years respectively). 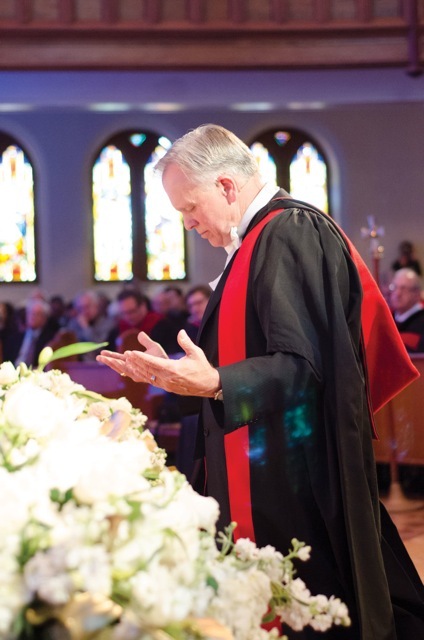 Mark Labberton, formerly the pastor of First Presbyterian Church in Berkeley, California, continues in his role as a professor of preaching as he succeeds David Allan Hubbard and Richard Mouw in the presidency. I’ve always thought the word “installation” a bit amusing in such contexts; in my imagination, it suggests that I need to don not only my academic robe, but my tool belt. But what an installation it was, permeated as it was by the Holy Spirit and Mark’s signature warmth, humor, and devotion. The sanctuary of First United Methodist Church was packed to overflowing by attendees from near and far, including delegates in full regalia representing other academic institutions. Mark’s commitment to both gospel and globe were evident everywhere. The program was printed in English, Korean, and Spanish; prayers were offered in multiple languages; the central mall of the campus was bedecked with the flags of many nations. Humility is the only soil in which the graces root… Humility is not so much a grace or virtue with others; it is the root of all, because it alone takes the right attitude before God, and allows Him as God to do all. And we must also make what is primary pervasive, so that the mind of Christ permeates all we do. Yours is the pow’r that made our world in love, And yours now the mercy given from above. / Equal with God, yet grasping not Your own, In grace You did offer love that calls us home. / Though made for glory, sinful lost are we, You laid down your life that we may now be free. / Tears, pain, injustice: hope that can’t be found, Now known in our Christ, whose death could not be bound. / May we now show Your life of selfless love, And make Your mind ours, all praise to Christ above! O that with yonder sacred throng We at His feet may fall! / We’ll join the everlasting song, And crown Him Lord of all; / We’ll join the everlasting song, And crown Him Lord of all! There is something about envisioning the glory of the future that puts the present in perspective. And I, for one, am glad for the leadership of Mark Labberton as the seminary community looks look forward into that future.